iStock/Thinkstock(NEW YORK) -- The first half of the weekend was a washout for much of the Northeast, thanks to heavy showers and thunderstorms that continued throughout the day. 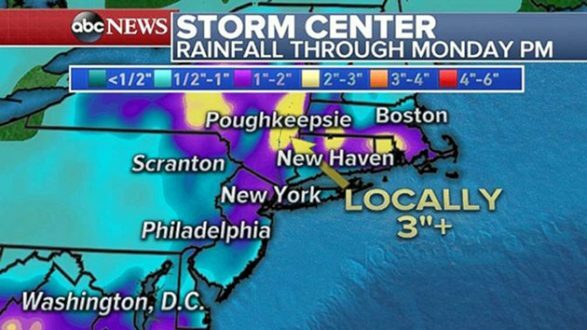 Many areas received 2 to 3 inches of rain, while Caldwell, New Jersey, received 4.92 inches and New York's Central Park received 2.9 inches, a new record for the day. Flights at Newark Liberty International Airport were delayed, and one entrance of New York City's Penn Station was closed due to floodwaters. Monsoon thunderstorms rolled through the Las Vegas area again Saturday night. Dust storms and flash flood warnings were both issued by the National Weather Service for the region. Winds -- some that gusted to over 71 miles per hour -- and rain were so severe that, at one point, 62,000 customers of NV Energy were without power.